Alexander Koerner/Getty ImagesU.S. 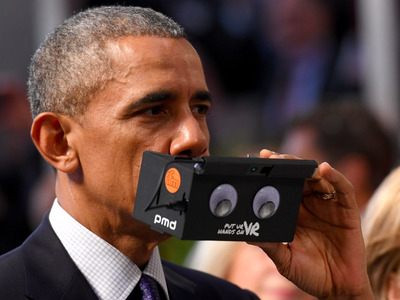 President Barack Obama tests virtual reality glasses at the ifm electronics stand at the Hannover Messe industrial trade fair on April 25, 2016 in Hanover, Germany. This is likely Obama’s last trip to Germany as U.S. president. The Hannover Messe is the world’s largest industrial trade fair. An employee of video game company Valve says that around a third of the company is now focused on either virtual reality or augmented reality. The Verge reports that Valve hardware engineer Alan Yates posted in a discussion thread on Reddit about Valve’s virtual reality headset, the HTC Vive. He explained that around a third of the company is working on the technology. “There are a number of teams around the planet doing great things in this new space, it is truly exciting. But we all owe a huge debt to those in academia and niche industries that kept the dream alive after the 90s VR implosion. People like Mark Bolas at USC where Palmer Lucky got his start and Jaron Lanier now at MSR who popularised the term Virtual Reality and has never stopped thinking about the future of digitally mediated reality. “I was super fortunate to start at Valve right around the time Michael Abrash had begun the AR/VR research team. It was a much smaller team then than it is now, it has since grown to encompass about a third of the company, but the key individuals that solved most of the really hard technological problems and facilitated this generation of consumer headsets are still here working on the next generation.